Jim Henson’s The Dark Crystal is a cinematic classic that helped define movies in the 1980s. For those who haven’t seen it (quick spoiler alert) the movie follows a gelfling named Jen on a quest to return a piece of the Dark Crystal before the Thra’s three suns align and the evil Skeksis gain immortality. This universe came from the mind of Jim Henson, so there are all kinds of wonderfully bizarre creatures wandering through it. 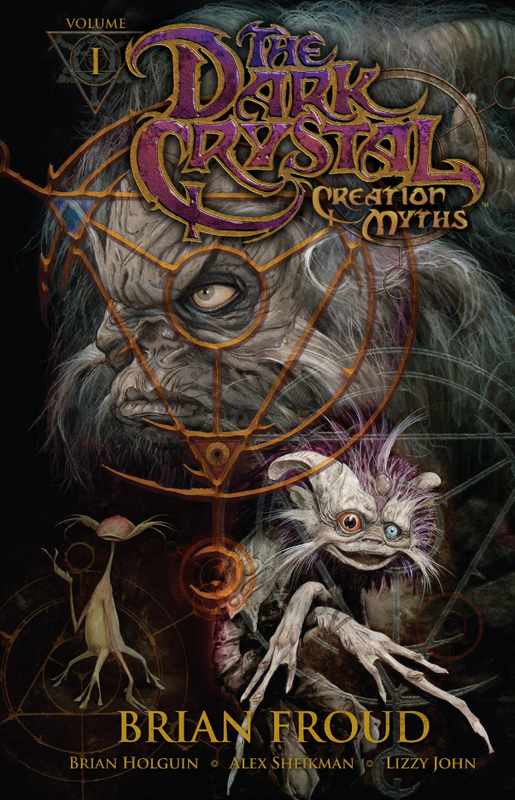 Archaia’s The Dark Crystal: Creation Myths Vol. 1 takes all of that wonderful material and expands on it, giving fans a deep new repository of story to enjoy. When it comes to licensed properties, especially ones that are so beloved, new material frequently seems to fall flat. Maybe it’s due to the regard with which people hold the original, or maybe it is an actual lack of quality on the part of the new stuff. Whatever the reason, I’m always a little skeptical when I pick up a new author’s addition to an old series. To be honest, I’m not a legacy fan of The Dark Crystal. I saw it for the first time a few years ago, as an adult. While some parts of the movie felt dated, I couldn’t help being drawn into the story. Henson had a gift for storytelling. The Dark Crystal: Creation Myths manages to draw the reader into that same world and expand on it without diluting what made it awesome in the first place. Much of this is due to the involvement of Brian Froud, the original designer of The Dark Crystal who worked with Henson. I have no doubt that much of the source material that Froud brought with him to the project came directly from conversations with Henson all those years ago. Even with that wealth of knowledge, it takes a quality writer to make the story come to life and Brian Holguin is definitely a quality writer. Holguin makes readers want to be a part of this universe. Each story within the books adds to the origins of Thra, while inexorably leading toward where the film picks up. More than anything else, Jim Henson and his Creature Shop are known for a visual style. 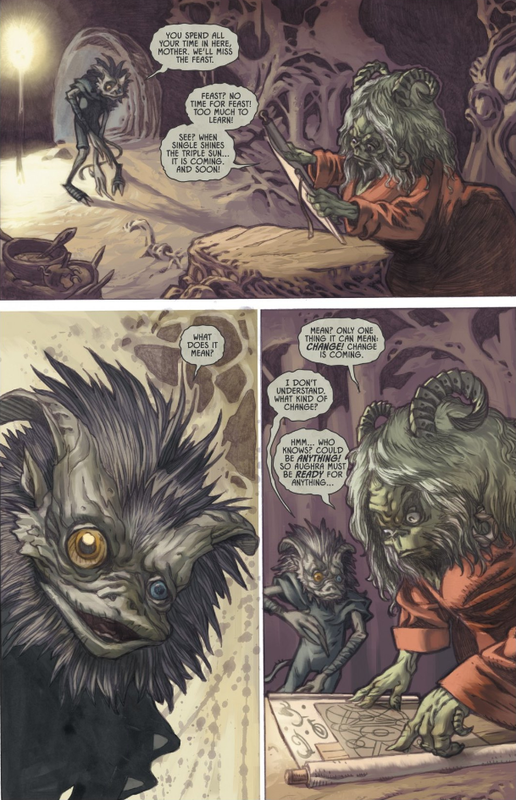 Given that comics are a largely visual medium, it makes perfect sense for this to be the format for The Dark Crystal: Creation Myths, if the level and quality of style of the original can be matched. Thankfully, Alex Sheikman and Lizzy John are up to the challenge. The artistic duo was able to capture the visual style of the movie without making it feel like they are just copying from it. There is a great sense of wonder captured in these panels that fits the concept of creation myths beautifully. Sheikman and John also do a great job in making the characters feel like Henson creations. The ways they move and hold themselves gives a sense that they are other-worldly. The character Raunip does this especially well and I repeatedly found myself trying to figure out how he got himself to move or bend in a certain way. While not immediately apparent, throughout volumes one and two the purpose of each story becomes clearer, and they begin to weave together into a much richer and more interesting story. I had no idea there was such additional depth to The Dark Crystal and I’m looking forward to volume three to complete the story. 4.5/5 Death Stars.